Welcome to our virtual book club! Every month we will review a book that influences, or has influenced, research on culture and end-of-life care. 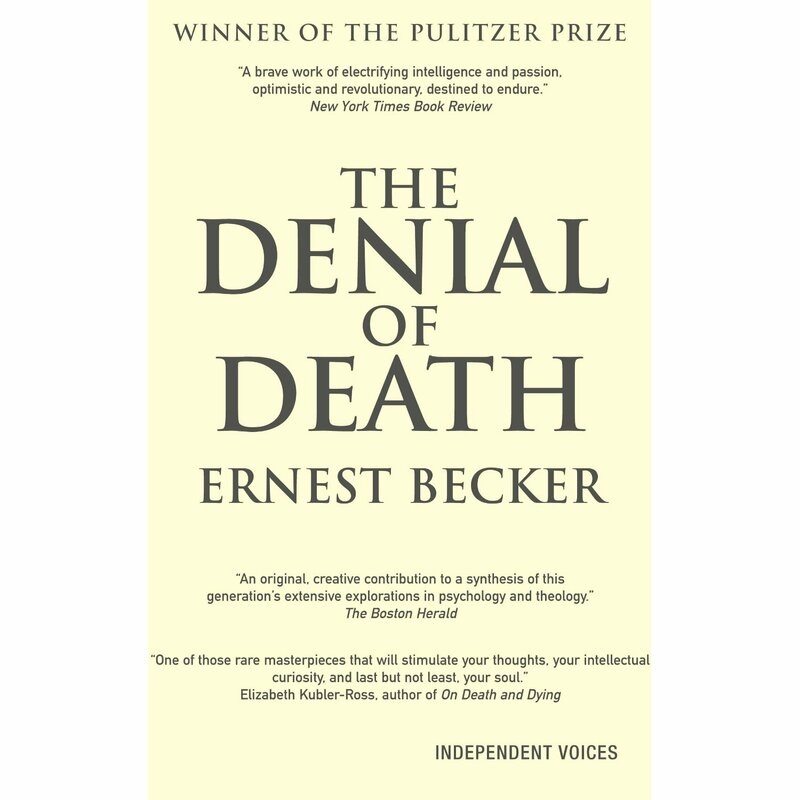 To kick off our book club series we’ll be having a look at Ernest Becker’s Pulitzer Prize–winning, ‘The Denial of Death’. In Denial of Death, published nearly 40 years ago, Becker builds on previously developed ideas (in his earlier books, “The birth and death of meaning: a perspective in psychiatry and anthropology” and “The escape from evil”) to eloquently argue that fear of death is the primary, unconscious, motivating force underpinning all human action. Becker reinterprets the theories of Freud: taking inspiration from the works of the philosopher Søren Kierkegaard and the psychologist Otto Rank, he uses an ‘existential’ rather than sexual framework. Becker argues that humans are caught in an existential dilemma: we are mortal beings conscious of our own mortality. Differentiated from the animal kingdom due to our symbolic identity, we are nonetheless consigned to the same fate as every animal. Hence this is our core problem: we are “simultaneously worms and Gods”. As they grow, children become aware of their bodily, and hence mortal, nature. This awareness produces anxiety – a ‘terror’ – that must be repressed in order to continue as a member of society. Repression of the fear of death is therefore innate and universal; as Becker puts it, ‘Everything man does in his symbolic world is an attempt to deny and overcome his grotesque fate’. ‘Heroism’ is a reflex response to this ‘terror’: the need to triumph over death through forming part of something larger and immortal. Not only is our character formed to repress awareness of death, but also culture is described as a symbolic action system designed to serve human heroism. Such a description of human society sounds, from the outset, rather noble: a system that supports heroic intentions. Becker however argues that from these noble intentions, ‘evil’ develops: conflicts and wars are, essentially, battles over immortality projects. Becker’s theory of culture can be seen as functionalist: immortality projects are a latent function of cultural-systems. Critiques of sociological functionalist perspectives are therefore also applicable to Becker’s work. Even though functionalist approaches remain unfashionable, the influence of the Denial of Death is still huge; a quick search in google scholar reveals over 10,000 articles published on terror management theory (directly derived from Becker’s work) in 2012 alone. The enduring appeal of Becker’s work may lie in its hopeful message: facing our fear of death can, ultimately, lead to better lives and better societies. Next month’s book club choices look at the end of life from a Tibetan Buddhist perspective. Natalie will review ‘The Tibetan Book of Living and Dying’ by Sogyal Rinpoche and ‘Life, Death and the After Death’ by Lama Yeshe on December 20th. An interesting article has recently been published in the Journal of Pain and Symptom Management concerning Xhosa traditional healers’ views of a ‘good death’. The abstract is reproduced below and the full article can be accessed here. South Africa faces enormous HIV-related mortality and increasing cancer incidence. Traditional healers are the preferred source of advice and care in Africa, and this is true for the large Xhosa ethnic group. To provide more appropriate multidimensional, culturally suitable care at the end of life; this study aimed to identify the care needs and cultural practices of Xhosa patients and families at the end of life, from the perspective of traditional healers. The study design was qualitative and cross-sectional. The research took place in a 300 km radius around East London, and Eastern Cape, South Africa. Interviewees were Xhosa individuals, who were recognized by their communities as traditional healers. Data from two focus groups and eight individual interviews were analyzed, using an inductive thematic approach. Data were elicited around the facilitation of a good death in terms of care needs before death and important rituals after death. Care needs before death focused on relief of psychosocial suffering; the importance of the spoken word at the deathbed; and the importance of a relationship and spiritual connection at the end of life. There were broad similarities across the rituals described after death, but these rituals were recognized to differ according to family customs or the dying person’s wishes. Awareness of potential needs at the end of life can assist clinicians to understand the choices of their patients and develop effective end-of-life care plans that improve the outcomes for patients and families. Citation: Graham N, Gwyther L, Tiso T, Harding R (2012) Traditional Healers’ Views of the Required Processes for a “Good Death” Among Xhosa Patients Pre- and Post-Death. J Pain Symptom Manage [Epub ahead of print].